I am standing on a street corner in downtown Fargo, jokingly holding a pay phone receiver to my ear. There’s an odd buzzing sound thrumming through the earpiece. It takes me a moment to realize what it is. Although I haven’t heard from her in a while, I remember her well—sedulous Ms. Dial Tone, singing her monotone song each time I lifted my phone from its cradle. But that was a while ago, back when I had home-phone service. These days, however, Ms. T. hardly comes around at all; occasionally she’ll make an appearance at the office, but even there she sings less and less each day, displaced by email and texts and data and, of course, mobile phones. Not surprisingly, no one has missed Ms. Dial Tone; no petitions are being signed to bring her back. Even though she played a vital role for 130 years, she’s no longer relevant. And she never will be again. 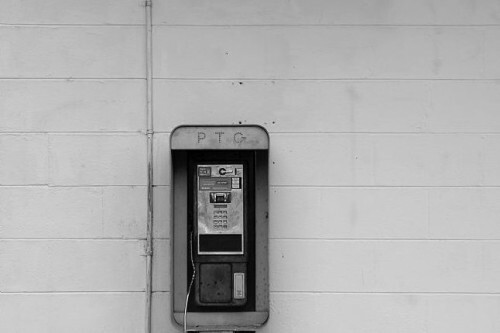 So here I am, pay phone in hand, listening to the droning sound of irrelevance. Likewise, there are material items in our lives that’ve added value for years—clothes, kitchenware, electronics, furniture, etc. But in time, even the most useful belongings become irrelevant. After which, we must let go, lest we cling to irrelevance. What possessions do you own that’ve lost their relevance? What would it take to let go? Join the conversations on Facebook and Twitter. “The Sound of Irrelevance” was originally a passage in Everything That Remains, but its chapter was one of many that didn’t make the final draft, so I decided to share it here instead. For more essays from The Minimalists, subscribe for free via email.